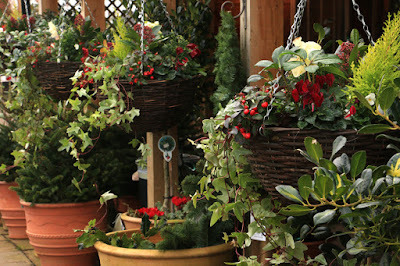 Christmas containers, hanging baskets, twinkling lights and a beautiful Christmas wreath adorning the front door. 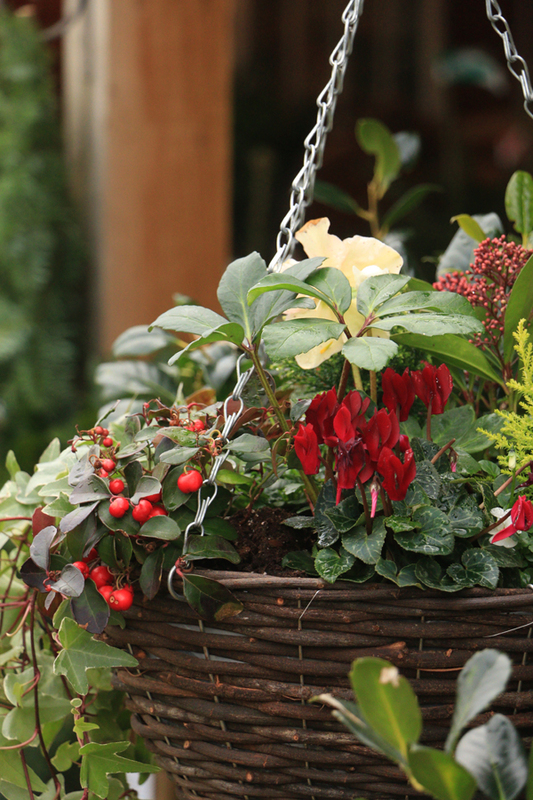 Create a Christmas welcome in your own front garden. How about Topiary box, Yew, Holly or one of the many small conifers bedecked with twinkling fairy lights wecomely placed at your front door. 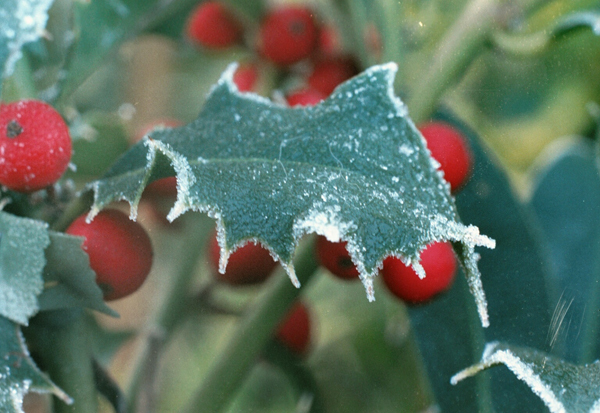 Holly Some plants personify Christmas. Holly (or Ilex) has got to be at the top of the list. Lolly pop, topiary pyramids all look great in containers. Hollys are one of the best evergreens to have in your garden, making great boundaries that will not get damaged by the wind and providing fabulous habitat and food for wildlife. There are certainly quite a few from which to choose. Self fertile varieties like Ilex aquifolium golden JC Van Tol, will produce berries without partners. There are some lovely colourful female varieties. These will have berries if pollinated by any male. Silver King or Golden King and their male partners Golden Queen and Silver Queen. (That is correct.) Females are often named Kings and Males, Queens in the world of holly! I particularly admire the ferocious looking male Ilex aquifolium Ferox Argenta commonly referred to as hedgehog holly, due to its vicious siverly spines. They look almost like icicles in the frost. This is possibly one of the most burglar proof plants, it is so prickly! 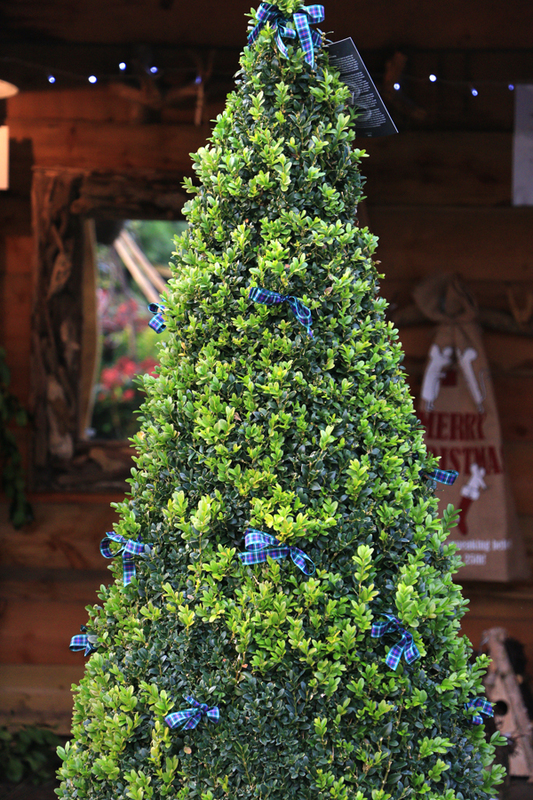 A none pricky lolly pop Holly can made a spectacular alternative to a tree. 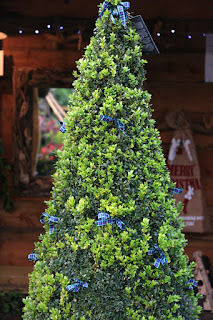 There are many lovely lolly pop evergreens you could decorate. 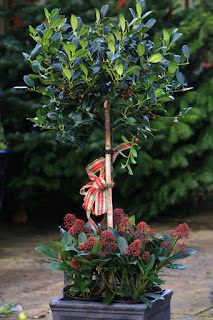 It is not unheard of to have a topiary Holly in a rich red pot in one’s living room as an alternative to the conventional spruce. Equally at home in the home are silver lolly pop Olive trees can look wonderfully festive dressed with simple decorations. Many small conifers can take up a tiny bit of table top space and lend themselves to a bit of decoration. Pot up festive Christmas containers; these can be very colourful and effective. Holly and ivy are our classic winter foliage but also use winter berried plants like Skimmia japonica, Pernetta’s and Gaultheria. 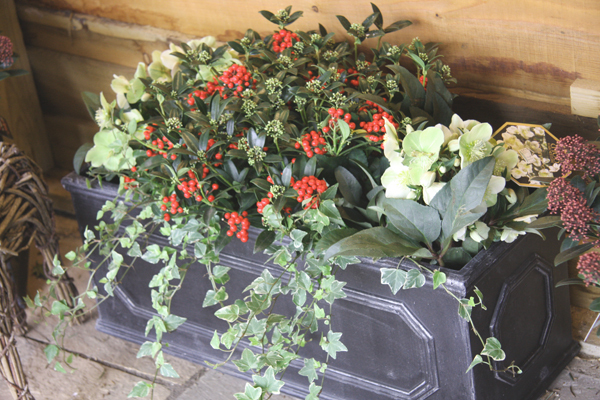 Mix with winter foliage in dark green, variegated silver and red. 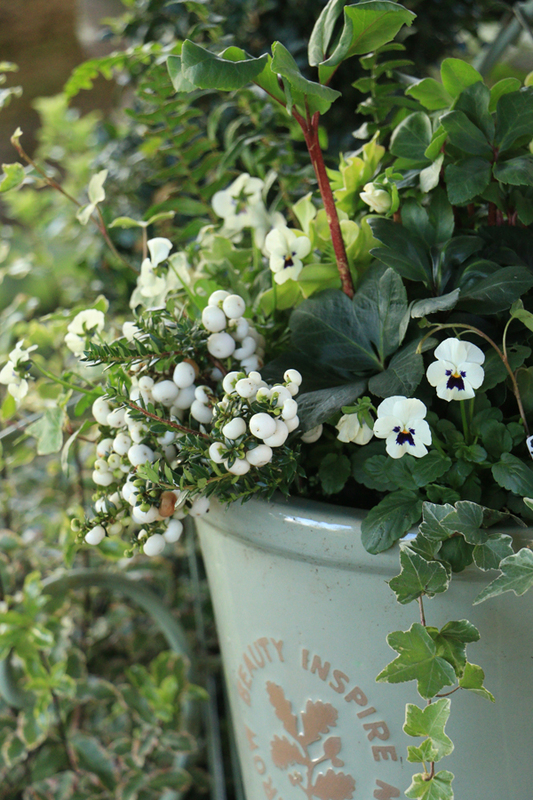 Plants like Euonymus, miniature Photinias and Viburnum tinus are ideal. The white berried Pernettya look gorgeous as do the outdoor cyclamen, white heathers and early white hellebores. 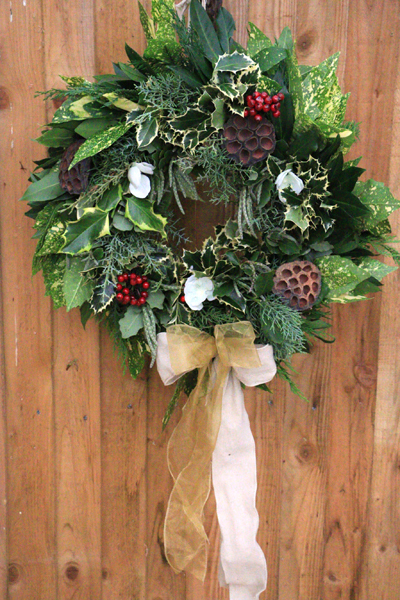 The front door is the place to hang a traditional wreath made of mixed foliage and berries (from your garden), decorated with fir cones, cinnamon sticks, dried oranges, Christmas ribbon, and a perhaps a sprinkling of artificial white Hellebores or Red Poinsettias. We run lots of Christmas wreath making workshops. Step inside and enjoy the aroma of Christmas. It’s not really Christmas without a real tree. The original Norway spruce gives off the best aroma, rivaled by the lovely fraser fir but is perhaps favoured by the Abies Nordmann or Non Drop tree, as it is more commonly known. It has large lush green flat shiny needles. A tree renowned for getting as wide as it is tall, if not pruned by the grower vigorously. 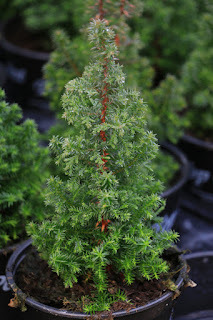 The fraser fir is aldo a non drop tree with waxy needles but it tend to grow as a more natural pyramid. We have a great selection of all varieties here at Preston Bissett Nurseries all grown in Britain. Bring a wonderful festive feel inside. Banisters and mantle pieces lend themselves to Christmas garlands. 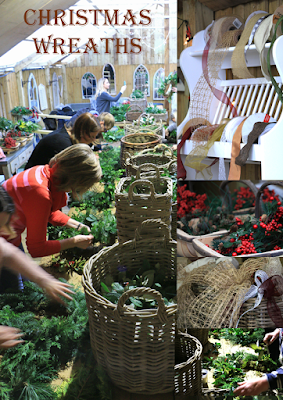 Swath them in dried oranges, cinnamon sticks, bay leaves, red berries, evergreen foliage from the garden and fir cones. To make a simple garland wire festive mixed bundles to a long rope. Table decorations can be as simple as a stocky cream church candle. Place in a large glass vase spruced up with a few pounds of fresh red cranberries holding it in place, almost effortless yet so effective! If you have a bit more time or feel more adventurous why not try a little forestry. A small terracotta dish with a bit of soaked wet oasis makes an ideal base. A long candle makes the perfect centre piece ideally placed in a candle support, though the oasis will probably hold it upright anyway. Decorate around the candle using small cuttings from a variety of evergreens and firs from the garden. A tartan, red or gold ribbon is optional! For that extra touch of Christmas pop a few sprigs of holly behind the picture frames. 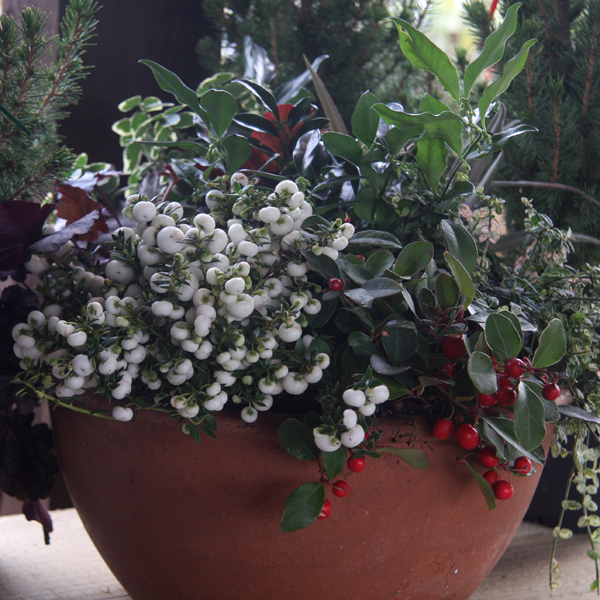 Every home needs a few fresh wintry pot plants. Poinsettias are probably the most popular, perhaps because the big red bracts are so bold, though you can get white ones. Avoid buying any that have been kept in a draft, by a door or outside. They are very sensitive to changes in temperature. Red and white Cyclamen are very Christmassy. Contrary to popular belief they are very easy to keep. Always stand them in water (never water them from above) and they will thrive. Azaleas are also very popular. They are a smaller relative of the Rhododendron with lots of colourful buds and often rich evergreen foliage. Orchids are in a class of their own- a little bit special. The flowers are elaborate and quite ornate often speckled and always a talking point. All these make great Christmas “thank you” gifts for teachers and neighbours. 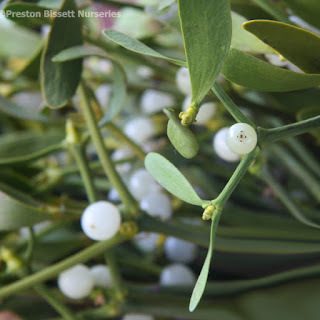 Last but not least on our list of Christmas plants we have Mistletoe Poisonous so not suitable for houses with young children. Traditionally hung up high, where the guys can kiss the girls. This is a plant steeped in religion and folk law. It is evergreen but it grows like ivy often on trees and plant host. It has many positive symbolic associations relating to the fertility, love earth and its continuance.